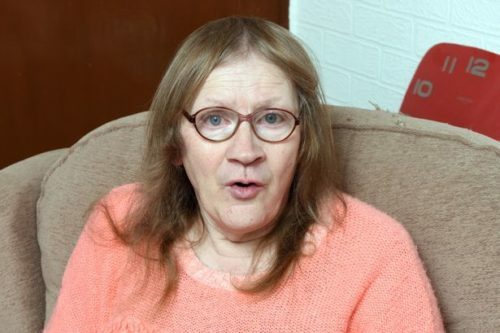 Hundreds of messages of support for Scottish trans woman Sandra MacDougall have given the 64-year-old retiree a new outlook, according to a tabloid report that detailed her story of prejudice, scorn and outright abuse and transphobic violence. 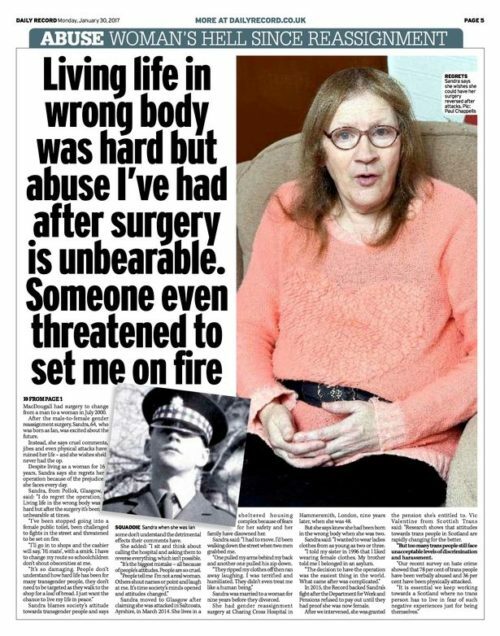 MacDougall, who told The Daily Record she regretted having gender affirming surgery in 2000, shared her life story with the Scottish newspaper Monday, calling the 16 years since a living hell. “I do regret the operation. Living life in the wrong body was hard but after the surgery it’s been unbearable at times. “I wanted to tell my story because I want people to understand what transgender people have to go through. MacDougall said that shopkeepers misgendered her, unruly teens tormented her, and the worst came three years ago when two passersby attacked her. “I had to move. I’d been walking down the street when two men grabbed me. “One pulled my arms behind my back and another one pulled his zip down. She moved to Glasgow, trying to escape the abuse, but it wasn’t any better. “I’ve been stopped going into a female public toilet, been challenged to fights in the street and threatened to be set on fire,” she told the paper. MacDougall’s story prompted hundreds of responses on its Facebook page. “She is a lovely woman and those of you who cannot accept her for who she is then shame on you,” Evelyn Jackson added. MacDougall now lives in a women’s shelter for fear for her safety.